This 4 bedroom luxury villa offers breathtaking 360 degree panoramic views over Paphos, Coral Bay, The Akumus Coast and the surrounding mountains. The villa is split over 3 levels and has the highest quality fixtures and fittings, it has been furnished to a high, contemporary specification. The villa has a large infinity pool with Roman style steps, a terraced area with sun lounger's and an outside eating area. The top floor terrace leading off the master bedroom has a stunning outdoor lounge area to enjoy a glass of champagne and watch the wonderful sunsets. Notes on accommodation: The villa is fully air-conditioned. Standard useage of electricity for air-con etc is included, up to 50 units per day. (Equalling approx 123.00 euro's for a 7 night stay). This is a very generous allowance if used sensibily. However, any useage of electricity over and above this daily allowance, will be charged at 40c per unit. Meters will be read on arrival & departure and any excess useage will be charge and taken from your security deposit. WIFI is available at €20 per week Utility Room: Fitted units, granite worktops. Wine cooler and microwave. Cleaning / Towels / Linen / Maid service: Freshly laundered sheets and towels are provided weekly. The villa is cleaned fully before and after each guests. Other: The second bedroom situated on the ground floor has its own kitchen area and side entrance. Modern, clean, nicely furnished and well equipped. 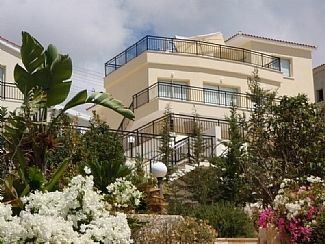 The villa is situated 5 mins from the beautiful Akumus Coast and turtle hatchery. It is perfect for walkers and bird watching groups. This panoramic view villa is located in the traditional village of Peyia and only 5 minutes drive away from the resort of Coral Bay with its many restaurants, bars, shops, nightclub and protected sandy beach. Paphos town centre and harbour area are within 20 minutes drive along the scenic coastal road and within easy reach to the north is the pretty village of Kathikas and the town of Polis and Latchi. The villa is ideally located for those that wish for a bit of everything from their holiday: relaxation, nightlife, golf and sight seeing. However a car is essential. Paphos Airport is half an hour drive. Changeover Day: Changeover on any day, but Sunday and Wednesday is recommended due to the availability of flights. Notes on prices: Prices are for the property per week in UK Pounds. Please note that we can apply a discount for under occupancy. Please enquire.